The earthquakes and their aftermath have hit the eastern suburbs hardest, so we feel that it is essential to have relevant community representatives’ involvement in the transition process to “Regenerate Christchurch”. Many members of our community face serious day-to-day challenges, such as substandard living conditions and uncertainty about the future of their homes. Many of the services and infrastructure in the area have disappeared or been withdrawn, and for “Regenerate Christchurch” to be successful, resident input is vital. We therefore hope that the Empowered Christchurch can look forward to productive cooperation between central and local authority bodies, on the one hand, and tax- and ratepayers on the other, over the coming years. The Christchurch recovery is now at a crossroads, where we need to look for a way forward and reach some difficult decisions. We also need to look back, since although the past cannot be changed we can all learn from it. In hindsight, it is clear that some decisions taken over the last five years could have been better. We need to make sustainable decisions at this juncture, so that generations to come can learn from our mistakes. Let us remember that our city of the future will be their city of the present. It is important to look in detail at how the recovery has been handled. We have been dissatisfied with the manner in which communication has been handled by the recovery authorities and also with the provision of and access to information. We feel that genuine community representation is lacking to a large extent: agencies are dependent for funding on local bodies, territorial authorities and even in some cases insurance companies. As a community group, we have frequently been stonewalled when asking questions or raising concerns. A series of decisions have been made over the recovery up to now where “all the stakeholders” are consulted but one. The stakeholder excluded from almost every decision has been the homeowner. If political planning is prepared to sacrifice sustainability in the interest of short-term cost savings, the consequences can be devastating for the people affected. Our main concern is that people who were fully insured may end up homeless, facing a lifetime of poverty after 2-3 political cycles. 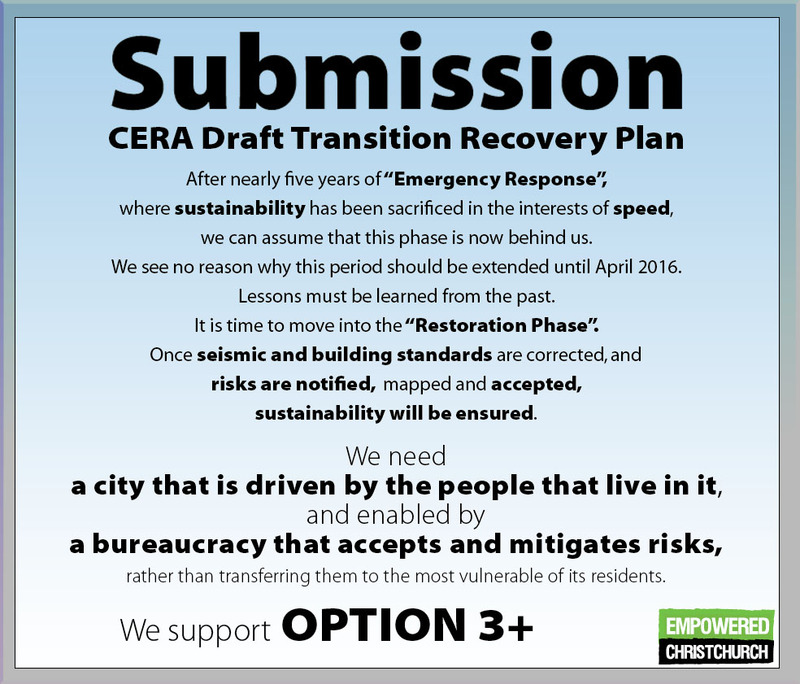 CERA made zoning decisions based on the assumption that individual solutions were available. In fact, individual solutions are not available in some coastal areas. The temporary stop banks in along the coastal areas are rapidly eroding. Some properties have been left below high tide mark on land that has a limited future life. The New Zealand Insurance Council has stated that they would like hazard notices attached to all properties with risks, so that people know exactly what they are buying. Certain coastal areas of land have been identified as high hazard and may disappear as the result of erosion within the next 50 years. The likelihood is that properties on such land will quickly become uninsurable in the years to come, and will not be accepted as security for a mortgage. Unlike insurance companies, banks are not risk takers and will foreclose on any mortgaged property that loses its insurance cover once hazards have been identified. The potential scenario residents face was highlighted recently on Radio NZ, when Westpac gave farmers in Northland 30 days’ notice to refinance, with the alternative of foreclosure on their farms. The 6.2 earthquake under the eastern suburbs on 23 December 2011, after which Lianne Dalziel, Bob Parker, John Key and Roger Sutton all indicated that new zoning decisions might be made, now appears to have been a mysterious event, since the ground shaking measurements for this earthquake have disappeared. This is one example of the lack of open and accurate communication from the authorities referred to above. There is also a reason to point out the New Brighton Earthquake that struck in 1869. One thing we can learn from the past is that seismic risk in Canterbury had been underestimated before the earthquakes struck. This is confirmed in a report for EQC in 1991. It is also the conclusion of the Royal Commission in the CTV report. A number of recommendations have been made but not followed. For example, neither the AS/NZS 1170.5 standard nor the New Zealand Geotechnical Society guidelines have been updated. Yet another recovery instrument is the Earthquake Prone Building Act, which is still to be passed by Parliament. As the emergency response part of the recovery is now behind us, we need to ensure sustainability for what lies ahead. It is the role of insurance companies, the EQC included, to accept the risks covered under their terms of reference/policies and compensate policyholders when such risks eventuate. However, many policyholders in Christchurch have not been compensated for the damage to their homes and lives. These responsibilities need to be faced by the entities responsible. An equitable solution needs to be found for properties with hazards such as flooding that are a direct result of the earthquakes. In tandem with this, every effort must be made to protect residents from the risks posed by climate change. Recommendations to the Department of the Prime Minister and Cabinet (DPMC) from ICNZ include taking a long-view – and requiring local authorities to deny consent applications where a long-term perspective risks from natural hazards will increase. It also recommended the issue of hazard notices for all properties affected. We welcome the long-view but we are concerned that due to the increased risk caused by the earthquakes, future insurance cover will not be available. When the District Plan is made operative the hazards will finally be mapped. Despite the fact that hazards have still not been mapped, we have examples of insurance cover being withdrawn, offered on a monthly basis, and fire insurance being refused. In an article in the New Zealand Herald of 5 November 2014, the CEO of IAG refers to cooperation with the NZ Government on a strategic intent in 2011 to avoid depopulation of Christchurch. Now that the ICNZ has signalled its intention to withdraw from high-risk areas and the CCC also plans to redefine the boundaries of the city so as to exclude properties below the Mean High Water Springs. We ask whether a “recovery” involves abandoning people once the insurance and bank sectors have managed a retreat. The EQC does not cover flooding events, which will represent the largest uninsured risk exposure for those Christchurch residents in the future. Homeowners have not had a fair representation in this recovery. The declaratory judgment was a one-sided decision, and in the middle of the proceedings CCC took the side of the EQC. The concerns of the community were not addressed in that judgement. EQC stated that it had not paid for subsidence of land before. In fact, EQC made compensation payments for subsidence after the Waihi ground subsidence in 2001. EQC and CCC reached an agreement to evaluate area-wide solutions for the Avon Estuary, knowing that the current solutions (temporary stop banks) would not suffice. The solution, which is currently being evaluated, is tidal barriers. This solution was previously rejected by the Ministry of the Environment in 2007, and identified as posing the risk of an ecological disaster. This has been done without consultation with the affected people. Meanwhile insurance companies have been settling insurance claims when it is known that the land has a very limited future. The EQC has still not communicated the known land damage to homeowners. CERA did not consider the NZCPS when they conducted their planning/zoning. Likewise, the statutory obligations of planning for coastal risk were not considered. Homeowners have been denied access to land information on the basis that the information is commercially sensitive. In fact, they have been presented with out-dated information that excludes over 100 earthquakes. These facts have been brought to the attention of CanCERN, EQC, MBIE and Council. There is still no explanation for why these documents have not been updated and are still being presented as current. The EQC stage 3 land report dates the last earthquake as occurring in June 2011. Yet we experienced over 100 earthquakes of magnitude 4-6.2 after that, most of which struck under the eastern suburbs. “The eastern suburbs of Christchurch city, which suffered the greatest housing and land damage in the earthquakes, are now experiencing greater rebuild and insurance complexities. The residents of these areas, many of whom have pre-existing vulnerabilities such as low incomes and/or a disability, are experiencing a more challenging recovery than those in other areas of greater Christchurch. The residents in the Eastern suburbs were no less insured than anyone else in the city. In fact it has been identified that there was more underinsurance in the western part of the city. Indemnity insurance is a priority for the recovery authorities. The only problem is that with full indemnity cover there is no accountability. Without accountability unsustainable practices can take place. The CERA community forum is one of the administrative structures whereby the Minister is expected to receive input from the community. However, our experience is that when serious matters are brought to the table of this organization, they are brushed aside or deferred. The minutes from the forum were not published until an OIA request was lodged six months later. The issues brought up were written off as a misunderstanding. The concerns pointed out to the forum are reflected in the results of a recent MBIE inspection of 14 properties, where 13 of them failed. The root of this problem was presented to the CERA forum in June 2013. Large sections of the minutes of the forum have been blanked out, which does not instil confidence. In short, we do not see that the forum is serving its intended purpose. Do you have any views on the powers and provisions that will be needed in the new legislation to support regeneration? Future insurance is a crucial element for the residents of Christchurch. As current legislation stands, large parts of the coastal areas in Christchurch face a future without any insurance cover or mortgages. The legislation powers should be used to enforce minimal low-cost insurance availability. If that cannot be achieved, rezoning needs to be considered. The EQC does not provide cover for flooding unless it is caused by another disaster. It may also decline cover for a hazard that already attaches to a property (Section 72 notification). In turn, insurance companies may reject a claim for hazard damage that has already been rejected by the EQC. This leaves property owners totally exposed to natural hazard risks. A recovery that leaves fully insured people in this position cannot be considered a successful recovery. Legislative powers need to focus on sustainability and consider that people’s lives are being planned for. Planning and decision-making that only takes the perspective of a political cycle can be very damaging for the city. The community will always elect representatives for long-term planning. However, politicians focus on 3-year planning cycles, since they cannot be sure they will be in office after the next election, Council, on the other hand, can take both approaches. The more consultation there is between the Council and community leaders the better the balance will be between short- and long-term approaches to issues. Legislation should not be allowed to delay sustainability simply in order to reduce costs. Christchurch hazards have been mapped by both ECan and CCC. According to the RMA 86(B) (3)(a), any notified hazard relating to water in coastal areas must be implemented upon notification, including the increase in the finished floor level (FFL) to 12.3 m above the Christchurch City datum. Council has informed homeowners that the hazard maps have not become operative because the district plan was passed by an Order in Council. As a result of this, residents have been denied sustainable planning and left at risk. It appears in this case that the legislation is obstructing sustainability, and any future legislation needs to consider this danger. We suggest that homeowners be provided with financial subsidies, including legal assistance. We propose the independent election of 5 individuals by the communities who would have the role of assisting with negotiations, submissions on laws, bylaws, plans and other instruments of the recovery. We agree with the CCC that any powers retained under section 27 should be exercised only at the request, and for the benefit, of affected local authorities, for a purpose that complies with the new Act. Do you think that the proposed new arrangements for the central city will create the ‘step-change’ needed to drive business confidence and investment in the central city? We fully support the idea of a Christchurch City Council-led recovery approach, with the Crown in a role of close cooperation. With the active engagement of community leaders, we believe this is the best solution, and the only way to restore the trust required to re-unite the city and move it forward. We cannot change the past but we can plan for a better future. Community engagement, sustainability and transparency are key components for success. Without these, there is the potential for the city to fragment and for serious conflicts to develop. The “too-hard basket” is overflowing and needs to be dealt with to avoid public unrest. We believe many aspects, such as a one-stop shop for resource consents and building consents, would help simplify processes. The long-running disputes over insurance claims must be resolved, and homeowners’ rights honoured. After nearly five years, a duty of care is owed to those affected and still suffering. One-sided arguments at the expense of the homeowner must stop. We are extremely concerned about the potential for “regulatory capture”. This concern also extends to the well-funded central and local government training of selected “leaders in the community”, and to other agencies such as RAS, which are mainly funded by the insurance industry. In far too many cases, there has been an absence of open and transparent communication. Independent and unbiased actions in the interests of the communities affected are required from all such bodies and entities. Neither South Brighton Residents’ Association nor Empowered Christchurch has a representative in this selected leaders group. We are in favour of CCC endeavouring to attract private investors with the support of central government. We suggest that successful businesses in Christchurch should also be given an opportunity for input here, or encouraged to open up their networks. Investment by supporting industries could strengthen local successes. The business connections are already in place. Are there any other changes needed to build confidence and encourage investment in the central city rebuild? If the intention is to attract foreign investment to the city, added facilities are needed. For example, there is a serious lack of swimming pools and saunas in Christchurch. This is a fundamental facility in most cultures, Christchurch can excel in this field and utilise the unique greenery and natural attraction of the red zones. We fully support tourist and visitor attractions such as the Eden Project. “Christchurch – unique – green and clean”. What are your views on the proposal for regular monitoring and public reporting on priority areas in order to hold agencies accountable for addressing recovery issues? Independence on the part of recovery agencies and the honouring of the provisions and specifications in insurance contracts is a vital part of the recovery (cf. regulatory capture risk mentioned above). The briefing to the incoming minister illustrates how these aspects have failed. In December 2012, CERA published the TC3 Residential Rebuild Booklet. “Home owners should note the fact that most insurance policies in place at the time of the earthquakes will cover the cost of building consent requirements to raise finished floor levels to meet standards set in the Building Act. Insurers will continue to work productively with the Council, EQC and other agencies to provide best outcomes for policyholders. Considering the number of properties still sitting below high tide after the earthquakes, this indicates that something has gone wrong in the recovery and that original principles have been abandoned. In your opinion, is there a better way to report on these recovery issues? We believe that, as regards residential recovery, monitoring should extend to code compliance certificates. According to figures published in 2014, only fractions of repairs/rebuilds are completed with the issue of a code compliance certificate. To conclude the work to the required standard, someone must pay for the code compliance. Leaving things as they are could have serious negative consequences for the recovery and for the city as a whole. We suggest an investigation of number of outstanding code compliance certificates and that responsible parties are made to address this outstanding work. We recommend that following this process structural EQC repairs are to be listed on LIM reports and form a final part of the insurance claim settlement with consultation with the homeowner. Looking at the recovery from the perspective of the eastern suburbs, it is impossible to avoid thinking of a phenomenon referred to as “disaster capitalism” and considering the aspects that have already become evident in the recovery process. Loss of equity and quality of life, risk transfer and other substantial shifts are taking place. We suggest that a regular mini-census should be conducted throughout the remainder of the recovery at intervals of 6-12 months to monitor deprivation, insurance cover (or lack of it), mortgage, home equity, and rental status. If unexpected changes identified, investigation and correction measures should be implemented. At the beginning of the recovery, the city’s residents trusted blindly in the authorities. People had learned to expect government and the authorities to do the right thing for them and treat them with care and consideration. Some people of Christchurch have now lost this blind trust, and frustration is building up; it will take significant efforts to reverse this erosion of confidence and stem the build-up of anger. To achieve this, there needs to be access to complete and accurate information, transparency, engagement, sustainability, fairness and care. Let us remember the much-quoted assurance from the Prime Minister in 2011: “On behalf of the Government, let me be clear that no one will be left to walk this journey alone. Christchurch; this is not your test; this is New Zealand’s test. Empowered Christchurch calls on the authorities to live up to this promise. After nearly five years of “Emergency Response”, where sustainability has been sacrificed in the interests of speed, we can assume that this phase is now behind us. We see no reason why this period should be extended until April 2016. Lessons must be learned from the past. It is time to move into the “Restoration Phase”. Once seismic and building standards are corrected, and risks are notified, mapped and accepted, sustainability will be ensured. We need a city that is driven by the people that live in it, and enabled by a bureaucracy that accepts and mitigates risks, rather than transferring them to the most vulnerable of its residents. Empowered Christchurch is an apolitical community group with over 2000 members set up to support victims of the Canterbury earthquakes, to find answers to their questions and to help achieve fair settlements for homeowners. Subject: Concerns of residents in the Eastern suburbs. Briefing for a meeting with Poto Williams MP. on Monday, 17 November 2014. Empowered Christchurch is concerned about recently published documents and the media coverage of the land damage in the Eastern suburbs. On the 5 November an article with the title, “How Christchurch avoided depopulation”, was published in the NZ Herald. The statements in the article included the following by Jacki Johnson, CEO of IAG. The first statement came from Tim Grafton, CEO of ICNZ. “take the long-view – require local authorities to deny consent applications where taking the long view shows risks from natural hazards will increase. high-quality data – establish a high quality, national natural hazard database to inform decision-making such as the cost-benefit trade-offs around risk reduction. “Shortcuts on plan a mistake”. “Southern Response, the Government-owned entity that took over AMI’s earthquake liabilities, and Tower Insurance have both complained about council proposals aimed at reducing the risk of flooding in low-lying areas.”…. In a document published by the Central Otago District Council the following is confirmed by the Earthquake Commission and ICNZ. “The Earthquake Commission Act 1993 gives the Earthquake Commission discretion to decline, or meet part only of a claim, where the certificate of title for the affected property contains such an entry. Whether the Earthquake Commission will actually decline part or all of a claim on this ground depends in part on the nature of the natural disaster that may occur. No such document has been published for Christchurch. Map generated from information from the Orbit Geotechnical Database. This shows that South Brighton had some of the most significant lateral spreading in Christchurch. Elevation map of the lowest lying areas of South Brighton that face the highest risk. Erosion Risk Map of Christchurch: Map B –C10 Christchurch Map Series. Several photographs showing the actual land damage, subsidence caused by lateral spreading. Comparison before and after the earthquakes. Images show actual subsidence and give estimation of increased relative rise of groundwater and consequential loss of ground bearing. In conclusion, it appears that recognising the high risks in some of the Eastern suburbs following the earthquakes has been delayed for the purpose of avoiding depopulation. As identified in the briefing to the incoming minister, the area’s residents frequently have pre-existing vulnerabilities such as low incomes and/or disabilities. Their homes represent their life savings. It is also clear that many residents have cash settled. Because of this approach to managing the recovery, vulnerable people have been severely disadvantaged, and according to statements from EQC and ICNZ, are unlikely to be covered by insurance if a natural disaster occurs in the future. The residents affected were not underinsured. The risks that have been identified for South Brighton for example are extensive and could all be added on the LIM reports for the affected properties when the district plan is updated. They include erosion, subsidence, liquefaction, flash flooding, tsunami and flooding. All these hazards may be excluded from insurance cover for the residents affected in the future. An insurance contract is a transfer of risk. You purchase an insurance policy, and the insurance company assumes the risk. Policyholders should not be left disadvantaged after a government-managed recovery that involves excluding the main stakeholders and jeopardises their life savings. The decisions taken to avoid depopulation mean that people have been incorrectly led to believe that their land is safe when it is not. On behalf of Empowered Christchurch we ask that you take our concerns and present our case to parliament. Empowered Christchurch is an apolitical community group set up to support victims of the Canterbury earthquakes, to find answers to their questions and to help achieve fair settlements for homeowners. MBIE has worked with two project Management Offices (Insurance Companies) and have recommended the following. “Maximise use of Schedule 1 exemptions” As can be seen on page 4 in this document. We disagree that the insurance companies are allowed to advise our regulatory authority. Their main interest after the damage has occurred will always be to reduce cost. This can allow cutting corners in the building process, cause unsustainable practices and transfers undesirable liability onto the homeowner. This is a sample letter that people can use to ensure risk and liability is not transferred onto them without their knowledge. This letter does not stop or hinder anything. It just makes sure you are kept informed. Following this notification you are in a position to negotiate and decide if you accept this risk or not. This is not legal advice. Feel free to copy, share and modify to suit your own circumstances. Attn: Christchurch Building Consent Authority. If a consent application has been submitted for my property, please withdraw it immediately and notify the applicant of the following restrictions. The reinstatement should be conducted by a third party without any significant involvement by myself, since I am not a qualified builder, will not oversee the project, and am in no way qualified to determine if my reinstatement will meet the Building Code requirements. If my area has suffered from lateral spreading, liquefaction or settlement, I expect the current legal boundaries to be established and a full survey carried out before any work commences. As a ratepayer, I choose to use the services of the Building Consent Authority to ensure that the building is up to standard and that the intended life of the building is 50 years or more. Likewise, I refuse any variations on the building consent without my prior written approval. I also decline to permit any third party the use of existing use rights under the Resource Management Act if this would result in any risk or liability or obligations being transferred to me as the owner of the building, or if this would result in any way in non-compliance with the current district plan. Otherwise, I would require an existing use rights certificate to be issued. I request a full building consent, including all producer statements signed by certified, qualified personnel and full inspection records. At the conclusion of the building work, I will require a signed Code of Compliance Certificate, PIM, a clean LIM report and a building location certificate if required. Please confirm acceptance of this notification. E-mail to propertyfileinfo@ccc.govt.nz or bring to CCC. If you wish to stop your insurer/PMO using exemptions or claiming existing use rights, you should first try to ensure that it will not involve any transfer or increase in risk for yourself (e.g. a hazard notice, a repair or rebuild that does not comply with your insurance policy entitlement, or with the Building Code). If you still have had no EQC land report or information on the amount of your land settlement, this is also an argument for delaying any construction or repair work. The condition of the land and the settlement amount may determine the best option for you. Each person’s situation is different, so if you are unsure, it is best to consult a property lawyer first. If you are unwilling to wait, you can also engage a surveyor to ascertain the extent of lateral spreading and where boundary locations should be. This letter will stop consents being issued for your property, but you will still have to negotiate with your insurer.